Thank you to our 2011 Sponsors. Thanks to LLB Signs and Hobbies for the gift certificate. The 1st annual Tuckerville 75 took place over the weekend at Tuckerville Speedway. Qualifying was super fast on the hard packed re-worked surface. After the heat races were over the two features were set. Both features had five cars, that ran 75 laps, with a mandatory battery change. The B Feature was all about survival. Three cars had to pull off the track for extensive repairs, which left Brian P. and Steve S. battling it out for the win. Brian P. took command towards the end of the race, and got the win. The A Feature was all about working through traffic. Chris had a strong car all race, but had some mechanical issues toward the end. Adam led several laps near the end of the race. It appeared he was on his way to the win, until he had to slow down for a car sideways in the middle of the track. Eric didn't waste any time and he made the pass on lap 73, and drove on to the win. 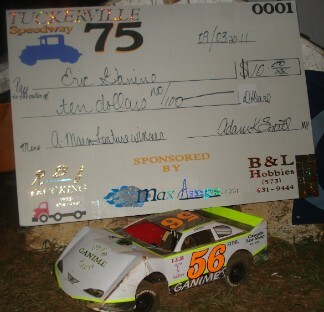 Eric received a giant check and bragging rights of winning the inaugural Tuckerville 75. Tuckerville was rained out again, so the Backyard Racing Association went to Shady Pines Speedway. It was double points and the $10 race all in one. The fast six qualifiers went to the trophy dash and raced for $10 donated by the track owner, Brian P. All the cars started the field in the feature for maximum points and a shot at the cash. Jim finished 5th and won $5, Chris got 4th and won $10, Adam came in 3rd and won $20, Darian finished 2nd and won $35, and Brian P. finished 1st for his first featue win, and won $50. The double points shook up the standings, and there are close battles for the top six positions. Due to a rain out at Tuckerville Speedway, Little Creek Speedway opened the gates for racing action. Max Amps batteries went to each feature winner and gift certificates from B&L Hobbies went to the feature runner up. There was also a $10.50 bounty put on Eric and the trophy dash streak. Along with regular money payouts and points, a 40 lap A Feature and a 30 lap B Feature, there was plenty to race for. Thank you to Max Amps for the Lipo Battery!!! Thank you to Max Amps for the battery!!! Thank you to B&L Hobbies for the gift certificate!! Also a big thanks to RBS Trucking for the additional sponsorhip! !